Office organizing supplies are a key to arranging your home or work office. When you arrange your office and keep the supplies you need at hand, you create a positive work environment. If you've ever been in an office supply store, then you've likely seen a warehouse of possibilities stocked with binders, paper clips, pencils, printers, file folders, dividers and more. Before you go into an office supply store and buy everything in sight, you need to decide what it is you need. Prior to shopping, create a checklist of items that are essential to your work environment. For example, if you do not generate a lot of paper work, then you will not likely need a tall five-drawer filing cabinet when a more compact two-drawer version would fill your needs. For the same reason, if you spend a lot of time highlighting data, you may want to purchase a large cache of highlighters and store them in a handy location. Once you have decided on the office organizing supplies that you will need, you will be ready to organize your office space. The key to organizing your office space is to examine the area that you have to work with. Whether you have a large space or a small one, you want to identify whether you need dual-purpose furniture. For example, if your office space in the living or dining rooms, you will want a desk that closes or is collapsible. This allows you to keep your office work private from family use. The location of your office will dictate the room you have. In smaller spaces, an organizing case or sewing box with your paper clips, pens, pencils, staplers, highlighters and other general use supplies is easily storable and accessible. It requires no desktop real estate and you can even take your supplies with you if you are on the go. If you do have a dedicated space for your office, you should consider investing in a label maker. First, you can label the office supplies that belong to you (staplers, tape dispenser, etc) to avoid the items walking off. You may also label the spots on your desk or office where the items are stored. This can help your family and co-workers return items to where they should be. While the top sales in office supplies vary from year to year, the following items are vital to desktop and workspace organization. They save you time by providing you with hands on access to what you need, when you need it. Printer/Fax/Copier Stand - If you have any or all of these items in your office, you will also have reams of blank paper, print cartridges and toner to keep track of. A separate stand frees up your desktop space and creates an automatic storage area for associated supplies. Unit Spacing - A bookshelf or shelving can provide you storage space for books, binders and other associated materials that you need to have at hand, but do not necessarily need on your immediate desk space. File Cabinet - Whether you choose a large or small file cabinet, keep all necessary and needed regularly files in the top drawer. Store those needed infrequently in drawers below. This keeps you from having to dig through files you don't need to access the ones you do. Paper Shredder - Again, even in a paperless world, paper shredders help protect you against identity theft as well as infringement of intellectual property. Shred any and all financial documents that are no longer necessary as well as copies of work papers that you do not need. By shredding, you can dispose of it safely and not have to worry about storing it. Supplies Drawer - For miscellaneous supplies such as scissors, sticky notes, tabs, highlighters, pens and pencils, use a supply drawer organizer so that you have everything you need right at hand. 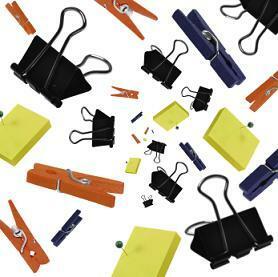 Efficient organization of your office with office supplies can save you a lot of time and money. Somewhere on your desk, you should maintain a notepad where you note what supplies you need as you get low or run out. This list can help you buy what you need when you need it and eliminate issues like buying sticky notes when you don't really need them.